As we pass crumbling colonial buildings and monuments to national heroes, we feel like extras in Our Man in Havana (I keep expecting to see Alec Guinness). But Graham Greene’s spy comedy was shot in black and white, and we’re being dazzled by a kaleidoscope of colours from the pastel-painted buildings that line our route. Oh yes, and we’re sitting in a bright pink open-top Cadillac. Seemingly frozen in time, without any of the fast-food chains and coffee shops that have penetrated so many corners of the globe, Havana retains a magnetic attraction. 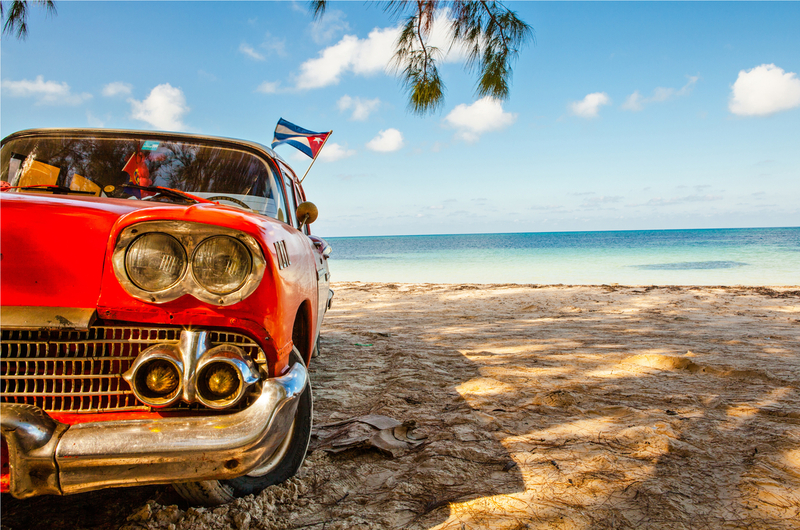 But with more US-based cruise lines set to sail into Cuba this year, following the relaxation of rules for American travellers, I was happy to be here before the inevitable changes begin. 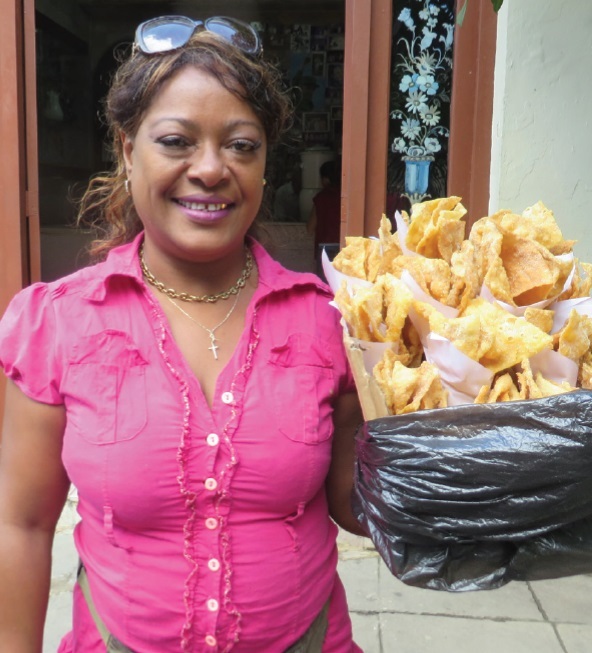 I’d been invited by a travel-writer friend to join her on a Caribbean cruise, and our 11-night itinerary included a night and a day in the Cuban capital. With Old Havana on the cruise terminal’s doorstep, we skipped the optional organised excursion to do our own thing. Top of our list was travelling in a classic American car. One of the island’s most famous sights, these pre-date the US trade ban, imposed in 1960 after communist leader Fidel Castro came to power. The resourceful Cubans just kept them running, and I was amazed by how many survive, ranging from spluttering private cars and taxis belching exhaust fumes to the gleaming specimens offering tours. As we burbled along the waterfront, holding on to our hats, this was just the best way to start our trip, with stops including Revolution Square, where Castro regularly addressed more than a million people. Today the lines of old Buicks and Chevys, waiting while passengers wander around the vast square, provide the chance for more snaps in a city that’s one big photo opportunity. Strolling around in the warm January sunshine, we discovered leafy squares, flea markets piled high with political books, countless cigar shops, street-food vendors and cafés serving strong, inexpensive mojitos to a soundtrack of strolling Buena Vista Social Club-style bands. I filled up my memory card in no time, but the most amazing sight was yet to come. 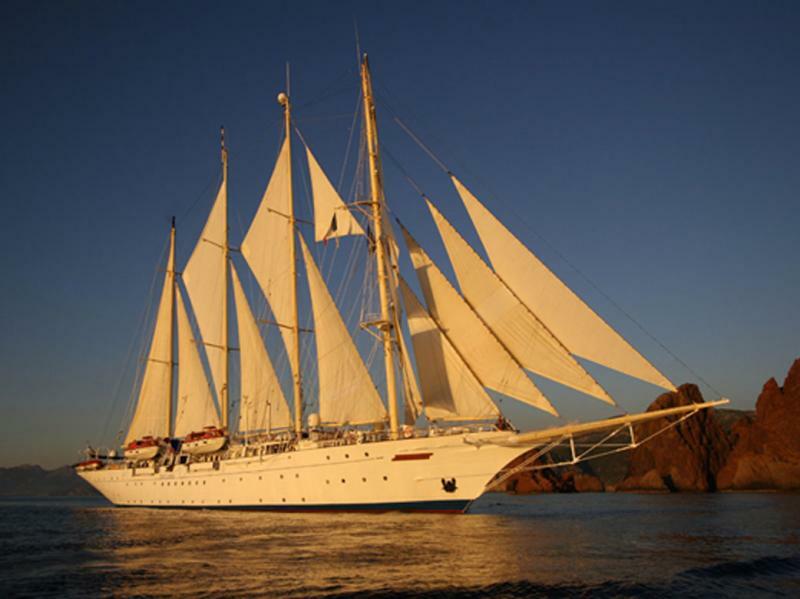 The realisation of Swedish entrepreneur Mikael Krafft’s childhood dream, Star Flyer is a stunning four-masted tall ship that accurately recreates the golden age of the clippers – but with modern comforts for her 170 guests. And she was to be our floating home for the next few days. I stepped aboard, scarcely able to believe my eyes. For all her grace, Star Clipper is tiny compared to the kind of cruise ships we’re now used to, and she was like nothing I’d ever seen – except on the big screen. Wooden decks, constantly swabbed clean by the crew, were dotted with neatly coiled ropes (though I was relieved to notice there were comfy-looking sunbeds, too, and a couple of small swimming pools). The interior is a vision of polished wood and gleaming brass, and our cosy cabin, with its round porthole, combined nostalgic maritime artwork with the creature comforts of snug beds, a TV and DVD player, hairdryer and private bathroom. Somehow I don’t think they had those on the Cutty Sark. The best was yet to come as we sailed out of Havana. The sight of 36,000 square feet of billowing cream sails and the stirring sound of 1492: Conquest of Paradise by Vangelis – always played as the ship sets sail – is a goosebumps moment that never loses its magic. In keeping with the authentic sailing experience, entertainment was fairly low-key. The most exciting pursuits were climbing the mast, which I never plucked up courage to do, and lying on the bowsprit nets as Star Flyer sliced through the water (she makes an average of 10 knots while sailing; slightly less under engine power when the wind drops). There was afternoon and evening music with the resident keyboard player, as well as bridge and engine room tours, talks by the captain and crew, watersports and an early morning exercise class. We found plenty to do, and my heap of holiday reading remained untouched. I particularly enjoyed an informative star gazing session, and my own five minutes of fame during the light-hearted crew show and passenger talent night. Undeterred by the fact that we appeared to be the only two entrants, my friend Jeannine and I plundered the dressing-up box, borrowed a rope and some empty bottles with the respective help of a sailor and a barman, and press-ganged musician Jerry to help us become the “Brexit Buccaneers”. Great fun – at least for us. On the two sea days I treated myself to a massage in the cabana at the top of the ship, and as the masseuse got to work it was a lovely feeling to drift along with a light breeze providing the air-conditioning. It was also half the price I’d paid for a similar treatment on a big ship, and there was no hard sell to stock up on expensive lotions and potions (not that there were any to buy). As a vegetarian I had wondered whether I’d go hungry, but I soon realised there was absolutely no danger of that. There were ample veggie options at every meal, and although I never stayed up long enough to see them, Jeannine assures me that late-night snacks were available too. On a couple of days we hit strong winds, one gusting at 40 knots, which I later learned counts as gale force. 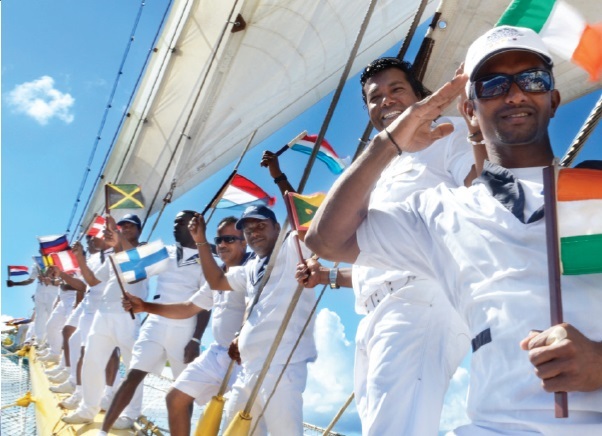 For seasoned seadogs and yachties, these were among the highlights of the cruise, and they scurried on deck to hang on to something stable and watch the crew trim the sails as Star Flyer pitched and rolled in the waves. For other passengers, me included, this was a time to run in the opposite direction to our cabins. This being my first time on a small ship, I had no idea whether I’d get seasick. Now I know. But sympathy and help was at hand in the shape of the onboard nurse who handed out a wonder pill. After a deep, 12-hour sleep I awoke next morning feeling much brighter – as (thankfully) was the weather. A few such episodes are the price you pay for the thrill of sailing, rather than cruising. And not everything went to plan: one morning the tender services to the island of Cayman Brac were cut short due to the swell, and another day left us in the hands of the unpredictable Cuban authorities when, after much to-ing and fro-ing, we weren’t allowed to visit the island of Punta Frances. But it was all treated as part of the adventure, and an impromptu cocktail party hosted by the captain that night as a liquid apology kept everyone happy. Our shipmates turned out to be a really eclectic and interesting bunch. Along with fellow Brits there were Germans, French, Swedes and Spanish, and a good mix of couples, families, friends and solo travellers. We quickly got to know names and faces as hotel manager Arnold steered us towards different tables of English speakers at dinner (there is open seating at breakfast and lunch). The relaxed vibe aboard, aided by daily cocktails and the eagerly awaited afternoon canapés in the Tropical Bar, encouraged a convivial, intimate atmosphere where you’d find off-duty officers and senior staff from the 77-strong crew sharing morning coffee or a nightcap with you, or boogying on the dance floor. Similarly, passengers could visit the bridge at any time and talk to the captain, except when Star Flyer was sailing in and out of port. 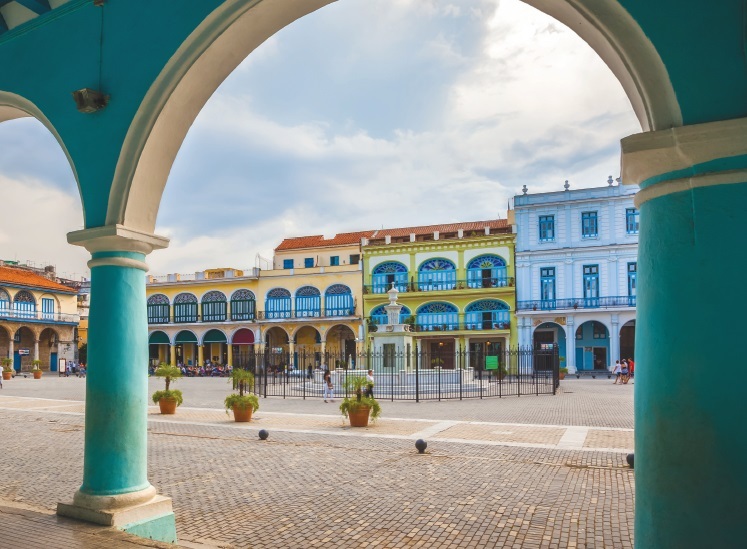 Diverse ports of call and excursions on our 11-night cruise included the timewarp Cuban city of Trinidad, Cayo Largo island with its turtle sanctuary, Grand Cayman and Jamaica. 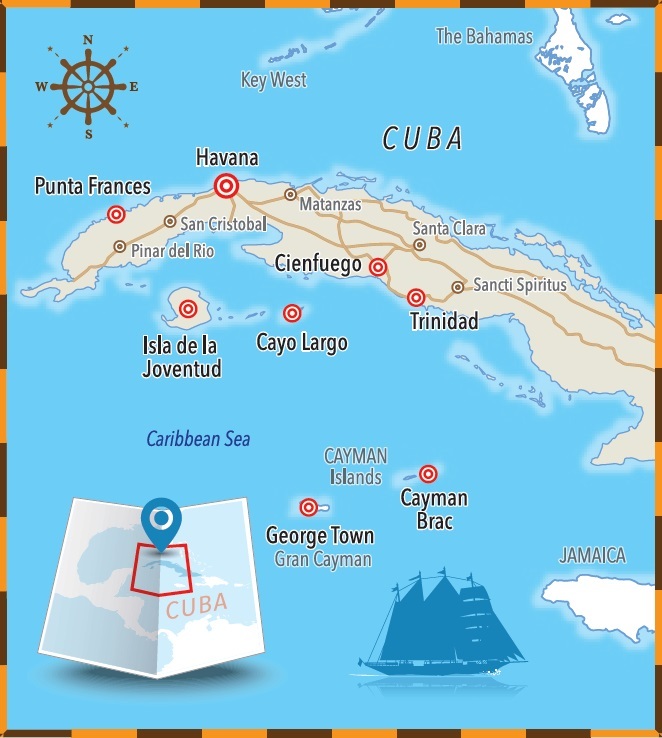 By the time we arrived in Cienfuegos, and the transfer for another night and day in Havana, we’d travelled 1,039 nautical miles, some 700 of them under sail. It was an unforgettable experience, and although I never read a page of Bruce Springsteen’s autobiography Born to Run – one of the superfluous books I’d lugged along in my luggage – at least I got to ride in a pink Cadillac.